Film geeks have a tendency to categorize. We love putting things into boxes and lists and confining them to genres to better quantify and compare them. Whether it's movies, actors, or directors, there's a comfort in sealing everything and everyone into a neat, identifiable package. To this point, filmmaker Jim Mickle's box would seem to be clearly labeled for horror, as he's crafted such grim but solid scare flicks as Stakeland and We Are What We Are. 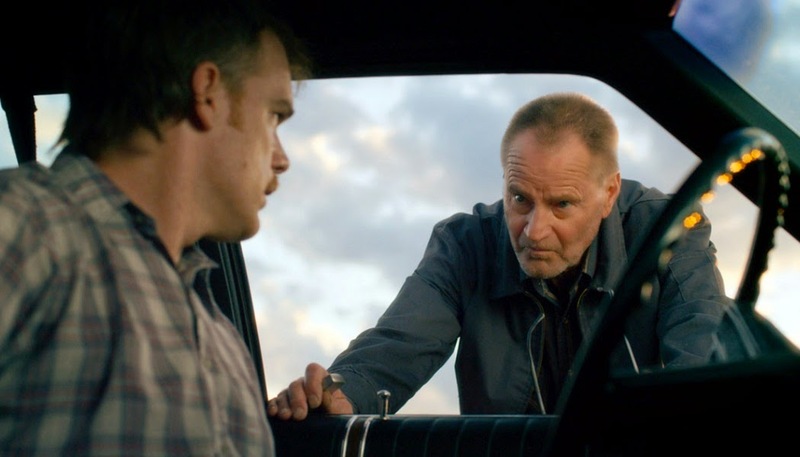 But with Cold in July, his adaptation of a Joe R. Lansdale novel, Mickle has put together a movie that resists being easily contained, mixing conventions and themes from multiple genres to keep us as pleasantly unsteady as the film's nervous protagonist. 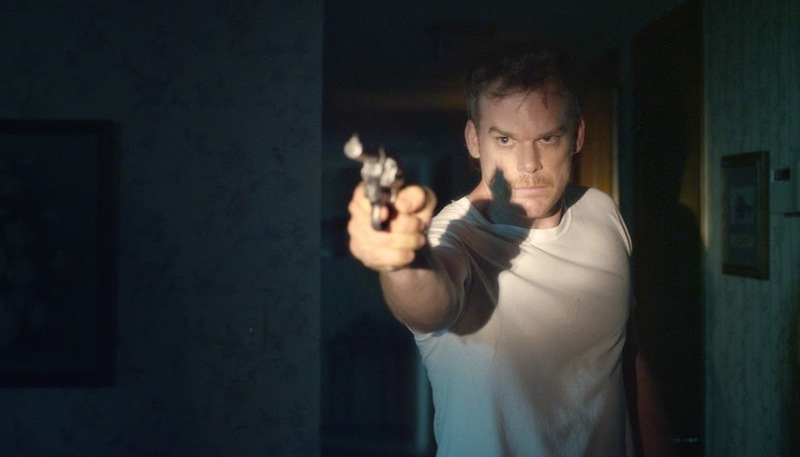 That would be family man and homeowner Richard Dane (Michael C. Hall), whose shooting of a intruder in his house shocks the small-town Texas community that never would have imagined he had it in him. While the incident is quickly ruled a clear example of the Castle doctrine and the sheriff guides him through the legal formalities, the guilt-ridden Dane can't go back to sleep, a condition definitely not eased when the burglar's ex-con father (Sam Shepard) rolls into town looking to settle accounts. To describe more of the plot wouldn't be fair but it's sufficient to say that just as we settle in for a Midwest take on Cape Fear, the rug gets pulled out from under both Dane and the audience, and we're forced to re-evaluate our perceptions from both a narrative and moral standpoint. The grime of a crime thriller, the murky morality of film noir and Western conventions of vigilantism and masculinity are fused to create something unexpected and unpredictable. As the film speeds toward its final, violent confrontation, the adrenaline gets pumping not only out of our concern for our naively decent hero but a refreshing lack of foreknowledge as to where the movie's going to leave us. Mickle's previous films have been superb at establishing a grim, richly-textured atmosphere but never has the environment and setting felt so integral to the story and its themes. Setting the film in the late 80s in Texas puts us squarely into Western territory, notably at a time when we had a cowboy of sorts in the White House and an old-fashioned paradigm of masculinity emerged. After all, this was the era when the nobility of cinematic heroes like John Wayne and Gary Cooper was redefined through Stallone and Schwarzenegger, men who took care of business by force and weren't prone to expressing fear, doubt, or vulnerability. But fear, doubt, and vulnerability are the primary traits of our hero and through him, Mickle offers a rebuke to both the macho excess of the 80s as well as the self-righteousness of modern 'stand your ground' culture. When the locals express their admiration for his act of self-defense, Dane is quite rightly uncomfortable with their praise and shows signs of post-traumatic stress that those around him seem determined not to acknowledge. Seeing his young son cheerfully playing with a toy gun, Dane quickly takes it away. When the dead burglar is buried, Dane feels compelled to attend the funeral. Through Dane's actions and choices, Mickle suggests the true measure of a man isn't his ability to dole out violence but to act on his sense of responsibility, even when the responsible thing involves doling out horrific violence. It's something that even Ben, the man who comes to terrorize Dane and his family, recognizes. For all his criminality, he shows signs of a twisted moral code and acknowledges his own culpability in the downward spiral of his son's life, a guilt which drives his actions and his need to balance the scales through force. This theme of parental responsibility continues the focus on family legacies that runs through Mickle's earlier work. Framing all this is a visual style that complements and reinforces both the Western themes and the tiny details of the time period through both production design and stylistic techniques. Note the cowboy pajamas that Dane's young son wears or how Dane himself eventually trades in his grotesque suburban shirts for the leather vest of a gunslinger. During a lull in the action, Richard pretends to leaf through a magazine while an advertisement on the back attempts to convey "How It Feels to Be a Man." The 1980s are brought to nostalgic life via blocky cordless phones, low gas prices, and video stores, while the contemporary work of filmmakers like John Carpenter and Brian DePalma are evoked by the colorful visual palette, the use of split-focus photography and the synthesizer music score. Just as Mickle works to move beyond the genre boundaries of his earlier efforts, Hall works hard to leave his most famous role behind, erasing the controlled bloodlust of Dexter Morgan and replacing it with anxious mundanity in a dorky mullet. If there is one narrative issue audiences might get hung up on, it's whether they are willing to accept how far Dane will go to adhere to his principles, as the narrative offers several points in the story where the average person would try to walk (or more accurately run) from the situation. That he keeps going down an increasingly dangerous path speaks to Dane's strength of character. Meanwhile Shepard plays effectively against type as the prison-hardened Ben, conveying a greater threat with a slight nod and a wave than many actors could by tearing up the scenery. He suggests the kind of quietly unsettling hard man you might find at the end of the bar who will turn your lights out without hesitation if you accidentally spill a bit of beer on his sleeve. 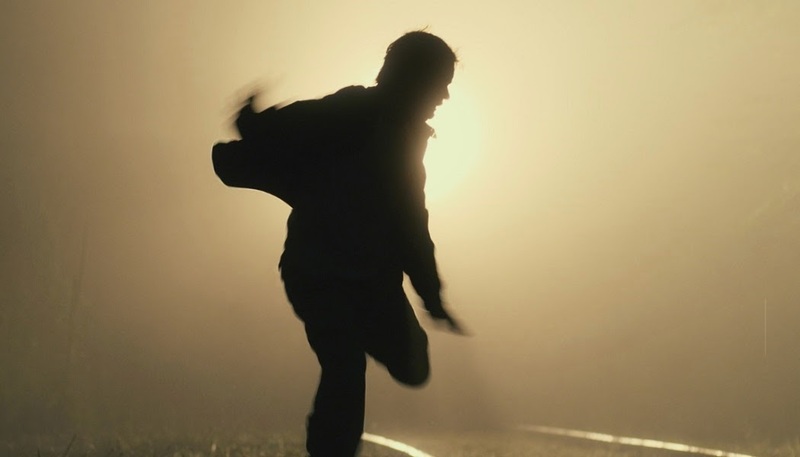 When the time comes for violence, he dispenses it with a sudden viciousness that is completely believable but not inconsistent with the character's warped morality. The big surprise is Don Johnson as Jim Bob Luke, a private detective pulled into the case. With his loud shirts and flamboyant personality, Johnson gets most of the film's scant moments of comic relief but like the movie itself, is able to switch gears on a dime to convey the weariness and buried outrage of a man who's seen a few too many horrors while navigating the criminal landscape and won't hesitate to combat evil when it's revealed. Mickle regular (and co-screenwriter) Nick Damici has a nice turn as the neighborly sheriff and Wyatt Russell (son of Kurt) hints that screen presence may be genetic, again subverting his boy-next-door looks to surprising effect. The only cast member a bit poorly-served is Vinessa Shaw as Richard's wife Ann, who comes across as oddly insensitive to Richard's trauma at points, ignoring his palpable unease to complain about the style of replacement sofa he's chosen. This may be deliberate to isolate Richard by offering him no source of solace and to emphasize the apparent threats to his male ego, but feels cheap and seems like something of a wasted opportunity. 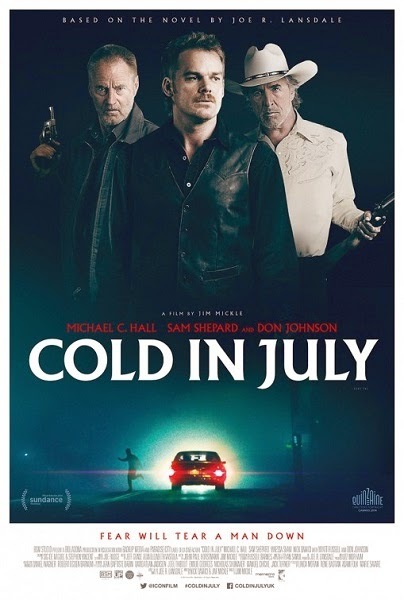 That aside, Cold in July is the kind of film that deserves out attention. Moviegoers are instinctively clever when it comes to story and can feel where and how a film is going to turn. Any movie that can cut our narrative safety lines by subverting those expectations to take us some place off the map should be cherished. If Jim Mickle's next movie proves to be as unpredictable and satisfying as his latest, the only thing we can safely expect is that it will be worth our two hours.